Tropical Storm Nicole is blowing through Ocracoke. The wind is gusting to about 40-45 mph, but there has been no tide in the village that I am aware of. I left my computers turned on last night (they are in my office at the Village Craftsmen), and the power was out for several hours, so the batteries had died by the time I got here this morning. The power came back on about 45 minutes ago. According to reports on the porch of the Community Store, lightning struck an electric pole near Quawk Hammock (about five miles north of the village), but it has been repaired. I have not heard any official report about ferry service, but I can't imagine that the Swan Quarter or Cedar Island ferries are running. Hatteras Inlet ferries may be operating, but I'm not sure. I wouldn't count on it! According the NCDOT Ferry Information web page: For DMV related questions, you may call 919-715-7000 during normal business hours for an immediate response. For all other questions, please call 1-877 DOT 4YOU during normal business hours for an immediate response. In other news...you can read my earlier post about Ocracoke Clam Chowder by scrolling down. I wrote that post several days ago and scheduled it for automatic update early this morning. At least one of our readers has requested a clam recipe. Clams casino are a popular favorite (small to medium clams on the half shell; topped with a splash of white wine, Parmesan cheese, and a slice of bacon; broil until the bacon is crisp; serve with crackers). Then there is clam chowder. Remember, Ocracoke clam chowder is a clear broth. As it says in the Ocracoke Cook Book, "Most Ocracoke people cook clam chowder very simply, but using different lengths of time. The size and tenderness of the clams can determine this. Don't be afraid to do your own thing with these recipes." 3 pints clams, chopped [I used 2 qts. The freshly caught clams had been put in plastic bags and frozen, then opened (remember to let them thaw a bit...it makes them easier to open...and you're less likely to cut your hand!). I put them, in small quantities, in the blender (for just a second or two). Bring all of the ingredients to a boil, then simmer for about 2 hours. Meanwhile fry out 2 thick slices of salt pork. Add pork and grease to the above; cover; stir occasionally. When potatoes are tender, clams are ready. Maybe the bacon and salt pork in the above recipes isn't very heart healthy...but it sure makes the clams tasty. ALL Hyde County Schools will have a 2 hour delay tomorrow morning. A coastal flood watch remains in effect through late Thursday night. Friday morning. Some isolated spots may pick up as much as 10 inches. low tide which will be around 6:00 PM this evening. normal. This will result in ocean overwash and beach erosion. of 7 to 10 feet by late tonight, peaking at 14 to 19 feet on Thursday. beginning tonight and continuing through Thursday night. A friend of Ocracoke Preservation Society sent this link to the Society. It gives much valuable information about researching the history of your home. This afternoon I will be helping Captain Rob with an NCCAT (North Carolina Center for the Advancement of Teachers) seminar, "The Age of Sail." We will be teaching the teachers how to make a traditional sailor's Turk's Head Bracelet. I've been wearing one that I made since last year's OcraFolk School. Rob taught me how to make them several years ago when I sailed with him on the schooner Windfall. They're a little tricky to make, but not too difficult when you're taught by a good teacher. However, I wonder how the first sailor figured it out. I guess it was a combination of a lot of brains and a lot of time. Here are a couple of photos. Click to view a larger image. I've always prided myself on being able to open clams with just my pocket knife. Though I must admit some of them are a challenge to open...sometimes even the smaller clams are difficult to pry apart! Over the weekend I took two bags of frozen clams out of my refrigerator to make clam chowder with. After opening only a few clams I drove the point of my knife into my left thumb. I swallowed my pride and went out to my tool shed and brought in my dad's homemade clam opener. It's a simple device that works like a charm -- just a block of wood (with a sizable goove to accomodate the clam) attached to a sturdy piece of aluminum with a series of slits and holes for the knife point. A steady hand and a little leverage is all that's needed to open clams safely. My wound is healing well...and I've decided to work smarter & safer (not harder) from now on. Below are answers to a couple of recent questions I've received (sometimes I answer questions in the comments section; sometimes in a separate post like this). Philip, please share with this NC mainlander what the word "scud" means. I could have looked it up, but I am sure your definition is more interesting to read! -- "Scud" is an old nautical term meaning "to run before a gale." In a broader sense it means to move or run swiftly, to be driven forward. It appears to come from the Norwegian word "skudda" meaning "to push." On Ocracoke its meaning has been broadened even further. Scud is used on the island as a noun and it generally means a short trip in an automobile or a boat. Recent postings and comments re. shipwrecked ancestors, "Ay-rabs," and Native Americans make me wonder whether anyone's ever undertaken any sort of genetic study of Ocracoke's most established families. -- The only genetic study of any of Ocracoke's original families that I know of is the Howard DNA Project (http://thehowardhistorian.com/page8.html). This project did not originate from Ocracoke, and, at least to my knowledge, no one on the island has participated. David, Lachlan, & I took a ride in the boat yesterday afternoon. The weather has been so magnificent that I have had to take advantage of it as often as possible. We didn't go very far...just for a short scud...and then we anchored in shallow water and went swimming. When we returned to the slip Lachlan decided to climb up on the dock without waiting for David or me. Our backs were to him, as we coiled line and gathered up our gear. It was a classic case of not being aware of the wind. He reached up and grabbed the dock while his feet were still on the gunwale. Of course the boat slipped away from the dock and we heard a wail. When we turned around his feet were just leaving the boat and he was clutching the dock with both hands. In a fraction of a second he was swinging like a pendulum, and holding on as tight as he could. I was amazed at how long he held on...actually long enough for us to grab hold of him before he would have plunged feet first into the water. He was a bit shaken, but quickly recovered. Eventually he was able to see the humor in it, but he also learned why we insist that he wear his life jacket in the boat (besides it's the law). Cousin Blanche is such an island treasure. Several days ago I had a comment on this Journal from the great-granddaughter of Epherena & Alexander Garrish. A second comment identified her as the granddaughter of William Calas Garrish, but she said she had never met her grandfather's Ocracoke family and could find no information about him...although she obviously was very fond of him. Last night I stopped by to visit Blanche and I mentioned Epherena, Alexander, & Calas. Blanche remembered "Freener" and Alex's home and yard (she even remembered what shoes she was wearing when she visited them on one occasion! ), how much damage was done to the house during the 1944 hurricane, and other details about the family. She remembered Calas and Ida's daughter Edith because Blanche and she were the same age, and they were in first grade together. The Garrishes moved to Philadelphia after the '44 storm, and Blanche said all of the Ocracokers who went to Philly to work would gather at Calas' house from time to time to play and listen to music. Blanche remembers how much everyone enjoyed the camaraderie and good times they had at Calas' home. If Calas' granddaughter (Florence? or Roberta?) is reading this, and you would like me to put you in touch with Blanche, please leave a comment with your email address and I'll send you information about how you can contact her. I seldom publish two posts on the same day, but I do today, so please don't miss my earlier post about the beautiful quilt being raffled by the Ocracoke Preservation Society. Although my calendar lists today as the beginning of autumn, I believe the official moment of the equinox occurred just before midnight yesterday (Eastern Time). After the Opry last night Amy, David, & I were marveling at the spectacular full moon which was casting its warm glow on our quiet village. With a pair of standard binoculars we were even able to make out two of the moons of Jupiter (the bright "star" near the moon). If your weather is clear tonight be sure to look up at the moon and Jupiter (it is about 400 million miles from earth!). If you have binoculars or a telescope take a closer look at both. They are truly amazing. Happy Equinox to all of our readers! 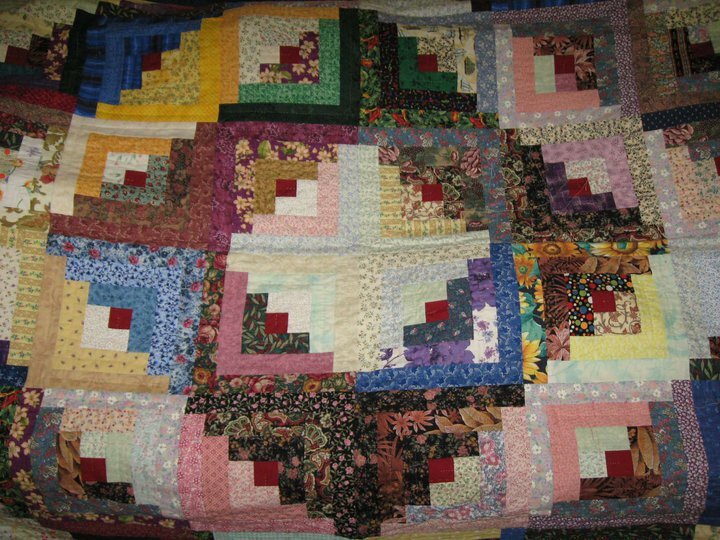 You could be the owner of this beautiful “Log Cabin” quilt, lovingly handmade and donated to the Ocracoke Preservation Society by the Ocracoke Needle and Thread Club. This quilt is now being raffled off by OPS. Tickets cost just $1.00 each. $5.00 buys you 6 tickets. The drawing will take place at the OPS fall Membership Meeting on Tuesday, November 9th. The winner does not need to be present to win, so buy your tickets now for a chance to win this outstanding quilt. We've published another Ocracoke Newsletter. This month's article is the story of Major General Ira Thomas Wyche, or "Cousin Iry" as my father referred to him. Ira Wyche was born on Ocracoke in 1887. His parents were Rev. Lawrence Olin Wyche & Lorena Howard. After both of his parents died (his mother in 1897 & his father in 1900) he lived at the Hatteras Inlet Life Saving Station with his grandparents, Captain James W. & Zilphia Howard. Ira Wyche entered West Point as a young man, and advanced steadily in the military. His stellar career included command of the 79th Infantry Division in WWII, including their invasion of France and advance into Germany until the war's end. He was later appointed Inspector General of the Army by President Harry S. Truman. About 50 years ago Sam Jones built a "small" house (smaller than the "Castle" which sits across the street) on Silver Lake harbor. Like his other buildings on Ocracoke, the Whittler's Club, as it was called, was covered in cedar shakes. Sam's vision was that it would become the gathering place for island men, a place where they could sit on the porch, swap stories, and whittle birds to sell to island visitors. 3. All true story instances are always invited. 2. The only way a member can lose his membership is by telling smutty jokes. 1. [my favorite!] No one allowed to get drunk except Harry O'Neal. Look for the story of Sam Jones in an upcoming Ocracoke Newsletter (maybe in November or December). I just received the following notices. Please read carefully if you are traveling to or from Ocracoke in the next couple of days. dredging by Tuesday evening or early Wednesday morning. Commuters could experience some delays until the dredging is complete. was forced to stop Saturday because of equipment failure. updates about ferry projects at twitter.com/ncdot_ferry. pipes damaged during Hurricane Earl. "A while back, Philip, you posted a photo of Lachlan on the way to his first day of school. If I'm not mistaken you promised to give us a report on how it went for him. But nothing since! How is it going on Ocracoke for the younguns as they enter school?" Every time I ask Lachlan how school is going he says "Great!" We take that as a good sign. However he can still be impish. Several days ago he found the "contacts" list in his mama's cell phone and called a friend to invite him to a party. The friend's mama answered (it was her cell number after all). When she asked to speak with Amy to verify the details about this "party" Lachlan said that probably wasn't a very good idea. You've got to give it to him for cleverness! Ayyy, Mateys! Today is International "Talk Like a Pirate Day." So buckle on your cutlass, light slow-burning fuses under your tri-cornered hat, and lift high your tankard of grog. Or at least "talk like a pirate." Just a reminder: Tonight at 6 o'clock in the school gymnasium there will be a community potluck dinner to welcome the new principal (Walt Padgett), the new Methodist preacher (Laura Stern), the providers at our health clinic (Erin Baker & Gail Covington), and their families to Ocracoke. Shakespeare on Ocracoke ("A Midsummer Night's Dream") was such a success that Charles Temple's English class is preparing to produce three student-directed 1-act plays this fall. There has already been one audition (this past Tuesday), but I'm guessing that, even if all the parts have been assigned (and I'm also guessing that they may not have been), that volunteers to help with various aspects of the productions would be warmly welcomed. For more information, contact Charles Temple at 921-0462. Island living wouldn't be complete without seafood -- clams, fish, shrimp, crab, & scallops. Last night it was fried fresh blue fish...a little salt & pepper sprinkled on before coating it with corn meal and laying it in the skillet. Country fried potatoes (with chopped onions, of course) and steamed vegetables rounded out the meal. Oh yes, also a glass of white wine...and ice cream & fresh strawberries for dessert! I invited Amy, David, & Lachlan over to share the meal and conversation (they include me in their meals often), and that made it all the better. As my grandfather said at almost every meal...We eat good in America! Lachlan sometimes changes it to We eat good on Ocracoke! I couldn't agree more. A couple of days ago I had this comment on the blog: "Another silly question ... if someone on Ocracoke doesn't have a washer and dryer, or it breaks, where do they do their laundry?" Well, I know that some islanders have made arrangements with family, friends, or neighbors to use their laundry facilities. Of course, one can always string up a line to dry clothes. However, I don't know anyone who is willing to wash clothes by hand in a galvanized tub. Those days are long gone...though our grandchildren might need to relearn that skill. A public Laundromat has been tried, but it was not successful -- too many salty bathing suits and beach towels, and lots of sand quickly ruined the machines. Last week Jude, Frank, and I decided to get together right after work on Thursday. We ordered a pizza and sat on my back porch enjoying a delightful late summer evening. At 7:30 we made our way to Deepwater Theater for the Molasses Creek concert. We all agreed that it was an outstanding performance. As usual, everything clicked. The band's energy level was contagious, and their songs, a wonderful combination of bright, foot-stomping tunes, thoughtful & reflective lyrics, fast-paced instrumentals, and humorous parodies kept the audience thoroughly engaged. I had almost as much enjoyment watching the people around me. Their heads bobbed in time with the music, and their smiles, laughter, and applause erupted spontaneously throughout the evening. It was as fine a performance as I've experienced anywhere. As I meandered down Howard Street on my way home I caught glimpses of the star-studded sky between the crowns of live oaks. At my gate on Lawton Lane I looked up into the unobstructed heavens. For a time I just stood in awe of the night sky, the Milky Way spread across the dome above me, bright and clear. As I placed my hand on the fence a shooting star streaked across the eastern sky. I opened the gate and walked quietly home. Lachlan & I biked down to the Jolly Roger Restaurant last night for supper and to listen to Lachlan's daddy and the rest of the band play. We wore long sleeved shirts, and took jackets with us. Almost everyone there had sweatshirts or jackets, and hats. It wasn't particularly cold, but nightfall and wind (15-20 mph) combined to make it just chilly enough (and dark enough) to remind us that summer is coming to an end, and fall is just around the corner. After a long, hot, and humid summer I think we're all ready for a change of climate. Put it on your calendar: Community Potluck Dinner, Saturday, September 18, at 6 pm. There are several new faces on the island...community leaders whom we welcome to our village. Erin Baker, D.O. has joined Gail Covington, F.N.P. at the Ocracoke Health Center. Walt Padgett started the new school year as principal of the Ocracoke School. Laura Stern was appointed this summer as pastor of the Ocracoke United Methodist Church. The dinner will be at the Ocracoke School Gym, and everyone is welcome. Please bring a covered dish, labeled with the ingredients. Plates, cups, utensils, napkins, drinks, and some meat will be provided. This is sponsored by the Ocracoke Civic & Business Association. Oh, and about the bugs: we've been extremely lucky this year...at least so far. Hardly any mosquitoes...but we always provide bug spray for anyone who wants to use it. My latest copy of the New Yorker arrived several days ago. One of the articles is "The Laughing Guru, Madan Kataria's prescription for total well-being." Kataria, a medical doctor from India, preaches and teaches Laughter Yoga, a loosely organized and fluid discipline that promotes laughter as a...well, as a "prescription for total well-being." Kataria is described as "an exceptional fake laugher" who inspires spontaneous laughter among his devotees without the aid of jokes or funny stories. The whole thing seems a bit far-fetched to me, especially when they claim that laughter can not only alleviate pain, but also mitigate Parkinson's and Alzheimer's diseases, improve multiple sclerosis, benefit asthma patients, boost immunity, and improve the survival chances of cancer patients. Then again, maybe it can. Perhaps that's why so many Ocracoke residents live so long (Ann Howard lived to be 117 years old...you can see her tombstone in the old George Howard cemetery on British Cemetery Road). Don't forget to laugh (at yourself, if necessary). It's good for the soul...and apparently for the body also. "Per his request, this will be a black tie event. Shoes are optional." It was just like Jim. Even his funeral service would be a celebration of his wit and humor. Jim taught school for many years at Ocracoke, and was one of the most beloved and respected teachers. As his obituary put it, "Mr. Cornette, 67, of Ocracoke, NC comfortably passed from this world to the next on September 3, 2010, leaving a wake of giggling nurses and healthcare providers shaking their heads....James lived his life by surrounding himself in fun, sarcasm and humor, always first draw with the one liner. He lived to poke fun with, or brighten the moment of anyone having a bad day." A Celebration of James' life will be held at 3:00 p.m. on Thursday, September 9, at Ocracoke United Methodist Church. There will be a time of Visitation from 2:00 to 3:00 p.m., immediately prior to the service. In lieu of flowers, the family requests that donations be made to the Ocracoke School College Fund, P.O. Box 1277, Hampstead, NC 28443. Living on Ocracoke just encourages freedom and spontaneity, I guess. I don't think Lida was belly dancing when she was a preacher's wife. One of the ferries that makes the run between Ocracoke and Cedar Island collided with a 35 foot motor yacht about 8:30 Saturday evening. Click on the link below to see a photo of the yacht. Under the photo click on "Back to Story" to read more details. There were no serious injuries. The cause of the collision is under investigation. "In all my years of reading about Ocracoke from local authors and your posts I have never come across a story indicating an islander had actually perished due to a hurricane. Lot's of frightening stories to be sure, but I don't recall any actual deaths (and not from shipwrecks, etc, but from actual island residents who die as a direct result of a storm). I'm thinking that number is very, very small, but perhaps you could share some of your vast knowledge of Ocracoke history here." I have always been told that no Ocracoke islander has ever died as a direct result of a hurricane. And this is true, as far as I know. I have never heard of any hurricane or storm related fatalities among islanders. However, a few years ago I came across an official report filed August 21, 1899 by S.L. Doshoz, Weather Bureau Observer at the Hatteras Weather Station, describing the "Old August Storm" of August 16, 17, & 18, 1899, one of the worst hurricanes ever to hit the Outer Banks. After describing the devastation in vivid detail he notes that "[a] pleasure boat at Ocracoke with a party of men from Washington, N.C., was lost and a portion of the party were drowned." Had the pleasure boaters taken shelter in the village they almost certainly would have survived. All transportation to Ocracoke is operating on normal schedule. The NC Ferry System resumed normal operations and normal schedule on Saturday, September 4 as of 5 AM. Tolls will be waived for residents with appropriate stickers subject to availability. Residents trying to return to Ocracoke on Saturday, September 4 should be in line for the ferry 30 minutes prior to departure. The Hatteras-Ocracoke route is open as of 5 AM today. They are running on the hour until further notice. Pay attention to Highway 12 on Ocracoke and Hatteras islands as overwash may make the route impassable. Be aware of standing water and sand on the road. I just have to re-publish one of my favorite comments that was posted during the storm. Many thanks to the anonymous poster for his/her confidence in us. "I have more degrees than a thermometer in meteorology, twenty years with NOAA as a research scientist (satellites), a very healthy respect for storms like this (combined with a very humble approach to Mother Nature) and after making my best prediction the very next thing I'd do is go to the folks like Phillip because, frankly, they have the experience. "I don't write this to minimize the risk and you certainly need to prepare for the worst, but with your years of experience AND taking the proper precautions...you guys will be fine. Ocracoke has a very long history of successfully riding out these storms. Yes, it's a dangerous storm. Yes, there will be damage. Yes, there will be flooding, but Earl is not going to bring you anything you haven't seen before. "That being said...I'll certainly say a prayer for your safety. Ocracoke has been my "vacation home" too for almost 40 years now. No other place like it in the world. "Good luck and see you on the other side. I'll be watching the airport webcam for as long as it holds up!" What is the criteria for cutting power? As far as I know, there was no decision to cut power or water unless lines were down or the tank was perilously low. I think our power was out because lines were down on Hatteras island (our power comes down the banks...we are the end of the line). Thanks for all the updates; Surprises me that the sound-side is highest; would have guessed the surf side. Any intuition why? As hurricanes pass by they push water to the west, across the sound (direction of circulation is counter-clockwise) where it backs up on the mainland. Then after the storm moves north storm winds bring the tide waters back across the island from the sound side. As of 10 PM [Thursday], they still have power on Ocracoke, at least the Ocracoke Harbor Inn webcam shows lights in the distance, plus there are lights on at the airport. (from the obxcams website.) Maybe Philip is being a "tease" and keeping us all waiting! Hopefully things are so calm they are out on the pizer enjoying a conversation or a game of cards! Things were still relatively calm, but the reason I wasn't posting is that I don't have Internet access at my house, and I didn't want to run back and forth to the Village Craftsmen during the night and in hurricane force winds. Maybe another reason was that we were having a great time chatting and drinking gin & tonics! So grateful to know you folks are okay!!! Could you let us know how things are on North Pond and Oyster Creek? I rode my bike up to the Pond and everything looked good. I'm guessing there are no problems at Oyster Creek...at least I haven't heard of any. Philip is funny - sleeping through a hurricane and the rest of us were awake watching the weather channel. All those that stayed will have some cleanup. Wish we could be [there] to assist. I'll be teaching Zen meditation next week after the Ghost Walks! I am publishing the latest advisories below. They have information about roads, ferries and re-entry passes. Please note the dates and times for each advisory. The mandatory evacuation has been lifted for Ocracoke. The county is still under a state of emergency for today, Friday, September 3. A tropical storm warning is in effect from Ocracoke inlet to the North Carolina/Virginia border. No major structural damage and no injuries reported. Highways are reported open throughout the county. Full power has been restored to all of Hyde County. Damage assessments began at daybreak in Hyde County will be released as reported. Water should recede late morning into the afternoon as conditions improve. Significant swells will continue a high risk of strong rip currents through the day. People are urged to stay out of the water. Pay attention to Highway 12 on Ocracoke and Hatteras islands as overwash may make the route impassable. Currently, Highway 12 on Ocracoke is clear to Hatteras ferry from village by 4WD vehicles only. Be aware of standing water and sand on the road. NCDOT plans to have Highway 12 open to all traffic this afternoon. A ferry will leave today at 3 PM from Swan Quarter to Ocracoke and 3:30 PM from Cedar Island to Ocracoke. It is anticipated that there will be three ferries from Cedar Island and two from Swan Quarter to Ocracoke today. Traffic as indicated by purple and green stickers will be allowed on the island. Vehicles with red stickers will be allowed on as space available. The State Highway Patrol shall restrict access without appropriate credentials. Ferries are not available to tourists and visitors today. The Hatteras-Ocracoke route is not operating currently. This will be subject to change as road and weather conditions allow. We will release information when this route opens. It is anticipated that the NC Ferry System will resume normal operations on Saturday, September 4 at 5 AM. Tolls will be waived for residents with appropriate stickers subject to availability. This is the only information available at this time. Please tune in to local radio 90.1 FM on Ocracoke, the National Weather Service, and local television reports. Hyde County Emergency Services continues to review the latest weather forecasts, is coordinating with the State and nearby counties, and advising citizens on possible actions to protect themselves and their property. Please use the media contact phone number above for official reports on damage, road closings, and other inquiries. Storm Basis Preparation Initial Checklist: Check First Aid Kits/ Fire Extinguishers, Obtain medicine and prescriptions, Check and fuel vehicles and generators, Obtain cash, Make pet arrangements, Pick up loose items around the yard, Protect vulnerable portions of property, Obtain non-perishable food and water for 3+ days (5+ recommended for Ocracoke), Obtain baby need or personal need items, Check battery powered electronics and generators, Assemble valuables and documents that cannot be replaced easily. The mandatory evacuation has been lifted for Ocracoke. The NC Ferry System is in reentry mode for today and tomorrow. We anticipate that all transportation services (air, marine, vehicular) will resume to normal operations on Saturday, September 4. Reentry traffic as indicated by purple and green stickers will be allowed priority today. Vehicles with red stickers will be allowed as ferry space is available today. The State Highway Patrol shall restrict access without appropriate credentials. Ferries are not available to tourists and visitors today. The Hatteras-Ocracoke route is not currently operating. This is subject to change as road and weather conditions allow. We will release information when this route opens. It is anticipated that the NC Ferry System will resume normal operations and normal schedule on Saturday, September 4 at 5 AM. Tolls will be waived for residents with appropriate stickers subject to availability. Residents trying to return to Ocracoke on Saturday, September 4 should be in line for the ferry 30 minutes prior to departure. The Ocracoke Airport is currently closed. Likewise, private marine traffic to Ocracoke is restricted today. They will both be open to traffic effective sunrise on Saturday, September 4. That is almost the worst that can be said about the aftermath of Earl...almost. I did see one tree lying on top of a roof (at Ocracoke Restoration), but it hadn't punched any holes through the roof, or even torn off shingles. And the outer portion of the dock at Ocracoke Harbor Inn has collapsed. There surely is other damage, but everyone I saw and spoke to agreed -- the damage was minimal. The tide was up in several places around the village ("flowing like a river" one neighbor said), but it had receded by morning. Blanche's house is very low to the ground, and the tide came up to her siding, but not into the house. We lost no trees on Howard Street, just a few branches and limbs. The last I heard there was sand on Hwy 12 between the village and Hatteras Inlet (I'm sure the state will be clearing that as soon as possible). I understand that officials are checking to see that the ferry channels are clear. Many thanks to Warner, Lou Ann, and Amy for posting information while I was unable to (after dinner last night I decided to turn off my computer at Village Craftsmen [I do not have Internet access at my home, and I didn't want to be running back and forth during the storm], and the power just came back on within the hour). Also many thanks to all of our readers for your concern and encouraging comments. There have been so many comments that I may have neglected to answer some of your questions. Please ask me again if I have not replied. The sky is beginning to clear, and I've got a bit of cleanup and re-organizing to do -- maybe even a little reading and a nap! I'll be back tomorrow, if not before. This is Amy Reporting my father's observations. We are in Carrboro making a vacation of the evacuation order. As of 8am today, it appears all is well on Ocracoke. There will be some clean up of course, but a quick glance out around the harbor indicates that there was not widespread damage. The power has been out since 4am with winds that felt like they were about 60-65mph on Howard Street. A stroll out to the harbor this morning verified that Howard Street was more protected, because the winds there were still quite blustery and quickly flipped the umbrella inside out. The tide did come up, however Howard Street houses appear to have all stayed high and dry. My father said he actually slept through most of the night, waking only when the house was really shaking and rattling. He has been up since early morning just checking on things in the area around the house. So far he's not been out to the beach to see how the dunes held up. Most cars are still staying parked on higher ground for the time being. It is good Philip has such good friends to blog for him and for you. By the way, this is Lou Ann broadcasting to you from Portland, Oregon...a far cry from Ocracoke Island. You can be assured, however, that I have only been able to think of Ocracoke Island since Earl decided to pay a call. I talked to Philip at 2:15 this morning. He was asleep (how does one sleep through a hurricane? ), but was glad to hear my voice. He said it was very windy and he could hear the branches brushing against the house in the darkness. He also said it is much better to have a hurricane during the day so that you can at least see what is happening. I told him to go back to sleep as he will probably have a big day tomorrow. I just checked the weather ticker Internet station which said Ocracoke was gusting to 73 miles per hour at 3:00 a.m. I will continue to keep you up to date until Philip can get back to blogging. So far the electricity was still on and his grandfather's house was holding up as sturdy as it has for 150 years. He also appreciates all your thoughts and wishes knowing that this hurricane will be moving into some of your areas as well. Media Contact: #252-926-4368 (new number for public and media inquiries). A mandatory evacuation has been issued for all visitors and residents of Ocracoke as of 5 AM on Wednesday, September 1. There is a hurricane warning for all coastal areas including mainland and Outer Banks Hyde. It is a current Category 3 Hurricane with intensity of 115 mph winds. A turn to the northeast is expected later today as Hurricane Earl passes off the coast. The closest path will be around 2-3 am Friday, September 3, which is also high tide. Seas may peak at 30 feet Thursday night and into Friday morning. Tropical storm force winds will spread across the area from the south this evening. The Outer Banks, from Oregon Inlet to Ocracoke, will see sustained winds increasing to 50-65 mph overnight, with wind gusts to hurricane force after midnight. Overnight mainland Hyde county winds are expected to reach tropical storm force overnight with gusts up to 60 mph. Winds will begin to be a serious threat to Ocracoke by 4 PM today. There is a potential up to 1 foot storm surge for Swan Quarter and Engelhard and an increased prediction of 4-6 foot storm surge on the back side of Ocracoke. Rainfall amounts for the Outer Banks are projected at 3-5”. The NCDOT’s Ferry Division has suspended ferry operations at the Ocracoke, Swan Quarter, Cedar Island, Hatteras, Currituck, Cherry Branch and Pamlico River routes. Operations will return to normal as soon as soon as the U.S. Coast Guard deems it safe to cross the rivers and sounds. Reentry will occur when damage assessments are complete and the island is safe for all to return. Emergency services, government agencies, commercial vendors delivering essential groceries and supplies, and permanent residential traffic as indicated by purple and green stickers will be allowed on the island via air and marine traffic. The State Highway Patrol shall restrict access without appropriate credentials. People with medical needs and unique situations are urged to consider their options. All Hyde County public safety services will cease after winds reach 50 mph sustained. Pay attention to Highway 12 on Ocracoke and Hatteras islands as overwash may make the route impassable. Those seeking shelter may travel to North Pitt High School, 5659 N. Highway 11, Bethel, NC. This shelter will be open at 9 am on Wednesday, September 1. Evacuees are encouraged to register with http://safeandwell.communityos.org/cms/ with the American Red Cross. Hi All, Philip's friend, Warner here, passing on some observations on Hurricane Earl from Philip via phone a few minutes ago. He is currently sitting comfortably in his home, with light rain, and moderate winds outside. He was out to look at the beach earlier, around low tide at 8pm, and the ocean was wild, with high waves, and lots of whitewater [Warner's note: Diamond Shoals recorded 21.3 ft waves just now!]. But so far, back in the village, there is not so much to report.. thankfully. Looks like there are at least some more bands of heavy rain and wind to come, and it is by no means over. Note that it looks like Frisco Pier has been been hit big time. And for us here in Chapel Hill, NC., a perfect rainbow at sunset. Expect an quick update later in the evening or early morning from Philip through one of his roving reporters. Half-hourly updates from (the perfectly named) Skip Waters (not related to Ron Burgundy !) on wcti12 here. Radar updates here and here . Earl's maximum wind velocity has decreased! Right here on Ocracoke the winds are about 20 mph...just a mild breeze at the moment. But I've got to go. Friends are coming over at 5. I'll be back later as long as the power is on. A mandatory evacuation has been issued for all visitors and residents of Ocracoke as of 5 AM on Wednesday, September 1. There is a hurricane warning for all coastal areas including mainland and Outer banks Hyde. It is a current Category 4 Hurricane with intensity of 145 mph winds. A turn to the northeast is expected later today as Hurricane Earl passes off the coast. The closest path will be around 2-3 am Friday, September 3, which is also high tide. Seas may peak at 30 feet Thursday night and into Friday morning. We are expecting hurricane force (74 mph) sustained winds with gusts up to 90 mph in the Ocracoke area after 10 pm and possibly extending until dawn and tropical storm force wind gusts on the mainland. Overnight mainland Hyde county winds are expected to reach tropical storm force overnight with gusts up to 60 mph. Winds will begin to be a serious threat to Ocracoke by 4 PM today. There is a potential up to 1 foot storm surge for Swan Quarter and Engelhard and an increased prediction of 4-6 foot storm surge on the back side of Ocracoke. Rainfall amounts for Ocracoke Island are projected at 3-5”. The NC Ferry system is operating on a first-come, first-serve basis for all vehicles open to Hatteras only. Swan Quarter and Cedar Island are secured. The last ferry off the island will be to Hatteras at 3 pm, subject to weather and road conditions. Schedules and toll collections are suspended during the evacuation order. All island residents and tourists must leave immediately. Residents on Ocracoke and the mainland in mobile homes or substandard housing are encouraged to seek proper shelter. Emergency services, government agencies, commercial vendors delivering essential groceries and supplies, and permanent residential traffic as indicated by purple and green stickers will be allowed on the island via air and marine traffic. The State Highway Patrol shall restrict access without appropriate credentials. Please make yourselves aware of the state ferry system’s schedule and road conditions before making travel plans during this time and after the storm has passed. Reentry will occur when damage assessments are complete and the island is safe for all to return. No, I haven't been asked to write my SS# on my arm...or attach a tag to my toe. The storm surge is definitely an issue. However, storm surges for the most part wash up on one side of the island (usually the sound side) and roll over and off on the other side. Unlike in the mountains (with steep riverbanks and cliffs) or on the mainland (where the water can back up) so that deep flooding occurs, Ocracoke is so flat and without deep basins that the flood tide can only get so high. It will eventually flow into the inlets. Only the barrier dunes will keep the surge from washing completely across, and they will be quickly breached...in enough places to provide relief. The last seriously high tide was on August 3, 2004. No one was prepared for the tide (it was as high as the 1944 storm) because the storm escalated so quickly from a tropical storm to a full blown hurricane. The most damage was to vehicles (hardly anyone had parked on higher ground). We lost about 500 automobiles then (Hurricane Alex). Don't worry about people on the beach -- at least not yet. I'm going out there in a little while myself to see what the surf is up to. I won't be swimming, just taking a look. Ocracoke village remains calm and quiet, with a light breeze of about 10 mph. Around town residents are securing their boats (almost all of the smaller skiffs are out of the water) with ropes tied to poles, sheds, anchors, or anything else that is unlikely to move. All of the higher terrain is beginning to fill up with automobiles. A neighbor pointed out that it's all about micro-topography! Other than bringing smaller items (bikes, trash cans, lawn mowers, etc.) inside, it's now simply time to visit with neighbors, chat on the Community Store porch, and wait and see. Below is the latest advisory. Note that, while Earl is a category 4 storm, predictions for Ocracoke call for winds in the mid-70 mph range, with occasional gusts to 90 mph. A mandatory evacuation has been issued for all visitors and residents of Ocracoke as of 5 AM on Wednesday, September 1. The hurricane watch for this area has been upgraded to a hurricane warning for mainland Hyde and Outer Banks Hyde. Hurricane Earl is expected to impact the Outer Banks coast, including Ocracoke Island. It is a current Category 4 Hurricane with intensity of 145 mph winds. Seas may peak at 30 feet Thursday night and into Friday morning. We are expecting hurricane force (74 mph) sustained winds with gusts up to 90 mph in the Ocracoke area after midnight and possibly extending until dawn and tropical storm force wind gusts on the mainland. Overnight mainland Hyde county winds are expected to reach tropical storm force overnight with gusts up to 60 mph. Winds will begin to be a serious threat to Ocracoke by 4 PM today. There is a potential 1-3 foot storm surge for Swan Quarter and Engelhard and a 3-5 foot storm surge for Ocracoke. Rainfall amounts for Ocracoke Island are projected at 3-5”. The NC Ferry system is operating on a first-come, first-serve basis for all vehicles open to Hatteras and Swan Quarter pending road conditions in those receiving counties. The Cedar Island ferry will not run again until the storm has passed. The Swan Quarter ferry will resumed service at 6 AM today and will likely cease operation at 9AM. The Hatteras ferry will run as long as weather allows. Schedules and toll collections are suspended during the evacuation order. All island residents and tourists must leave immediately. Evacuation routes may not be available after mid-morning on Thursday. Residents on Ocracoke and the mainland in mobile homes or substandard housing are encouraged to seek proper shelter. Lachlan was starting to come down with a chest cold so Amy & David decided to leave the island. They are now in Chapel Hill. A breeze is just starting to pick up...maybe 10-12 mph. The village is very quiet. "Tropical storm conditions expected with hurricane conditions possible. Showers likely. Lows in the middle 70s. North winds 35 to 45 mph with gusts up to 65 mph." This is the prediction for the strongest winds on Ocracoke from Earl. It is very much like the Hyde Co. Emergency Management prediction of 70 mph winds. To be sure, Earl is a large and powerful storm...but it should stay about 100 miles east of us, maybe farther, and the strongest winds are in the northeast eyewall. Again, thank you to all of our readers who are keeping Ocracoke and its people in your thoughts. A mandatory evacuation has been issued for all visitors and residents of Ocracoke as of 5 AM on Wednesday, September 1. The hurricane watch for this area has been upgraded to a hurricane warning for mainland Hyde and Outer Banks Hyde. Hurricane Earl has set on a more westward track, still brushing the Cape Hatteras coast. It is a current Category 4 Hurricane with intensity of 135 mph winds. Seas may peak at 20-25 feet Thursday night and into Friday morning. We are expecting 70 mph sustained winds in the Ocracoke area Thursday evening extending into the night and tropical storm force wind gusts on the mainland. There is a potential 1-3 foot storm surge for Swan Quarter and Engelhard and a 3-5 foot storm surge for Ocracoke. The NC Ferry system is operating on a first-come, first-serve basis for all vehicles open to Hatteras and Swan Quarter pending road conditions in those receiving counties. It is likely that the Cedar Island ferry will not run again until the storm has passed. The Swan Quarter ferry will resume service at 6 AM Thursday September 2. The Hatteras ferry will run as long as weather allows. Schedules and toll collections are suspended during the evacuation order. All island residents and tourists must leave immediately; congestion is low and weather is cooperative. Evacuation routes may not be available after mid-morning on Thursday. David, Lachlan, & I went out for a bike ride just before sunset. What a beautiful evening! Not only was it cloudless and calm...but there was hardly anyone on the road -- and they were all locals. We'd stop and chat now and then, but we did make it to the sound shore just before the sun melted into the water. A half dozen ducks were lazily probing for tasty morsels a few yards away. Lachlan learned two new words -- serene & tranquil. I suppose this is our last serene and tranquil evening before Earl gets here. I'm going to stick my neck out and make a prediction -- I think we'll get 60-80 mph winds late tomorrow night and early Friday morning...maybe even 90-100 mph winds...and soundside flooding about 2 am Friday morning. Remember, I'm no weather forecaster...just a local with a guess. Dale promises me he'll report all of the weather statistics after the storm has passed us by. A mandatory evacuation has been issued for all visitors and residents of Ocracoke as of 5 AM on Wednesday, September 1. The hurricane watch for this area has been upgraded to a hurricane warning for mainland Hyde and Outer Banks Hyde. We are expecting 60-70 mph sustained winds in the Ocracoke area and tropical storm force wind gusts on the mainland. There is a potential 1-3 foot storm surge for Swan Quarter and Engelhard. The NC Ferry system is operating on a first-come, first –serve basis for all vehicles open to Hatteras, Swan Quarter, and Cedar Island pending road conditions in those receiving counties. Schedules and toll collections are suspended during the evacuation order. All island residents and tourists must leave today; congestion is low and weather is cooperative. People with medical needs and unique situations are urged to consider their options. All Hyde County public safety services will cease after winds reach 50 mph sustained. Many thanks to all of our readers who are keeping Ocracoke and our community in your thoughts. We appreciate it very much. As long as I have power and Internet access I'll let you know what is going on here on the island. Right now all is calm and beautiful! Oh what a beautiful morning! The sky is bright and sunny -- temperature in the mid 70s. It reminds me of Sept. 13, 1944. 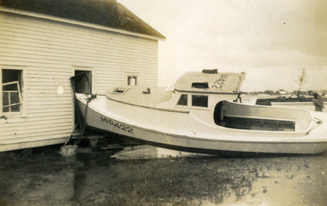 Aycock Brown had gotten word that a powerful storm was moving toward Ocracoke (this was in the days long before anyone but the military was tracking hurricanes). Aycock posted signs around the village, trying to warn people, but hardly anyone believed him; the weather was simply too beautiful. However, Stacy Howard, who had heart problems, and whose doctor warned him not to get overly-stressed, decided to heed Aycock's predictions "just in case," so he wouldn't worry so much when the storm hit. In those days most skiffs were simply tied to stakes in the harbor. By the end of the day Stacy had so many lines running from his boat to other stakes and anchors that the other men said it looked like a huge spider web. The "44 Hurricane" hit Ocracoke with a vengeance! 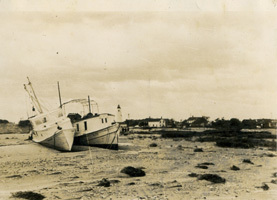 Winds were over 100 miles an hour, many houses were flooded by the rising tide, and boats were scattered all over the village. Several ended up in front of the Island Inn. The bow of one was poking in the door of a house. But Stacy Howard's skiff was right where he'd tied her up. From that time on, whenever anyone saw Stacy tying his boat up for a hurricane, everyone took him seriously and began their own preparations. It is different today. It is bright and sunny, but everyone knows that a storm is on its way. So everyone is making preparations. I'll keep you posted.